The OTvest can Help Provide Increased Work Against Gravity to Benefit Those With Osteoporosis. For strong bones, it’s important to eat a diet rich in calcium and vitamin D, and like muscles, bones get stronger when you use them. The best moves to strengthen bones are weight-bearing exercises that force your body to work against gravity. 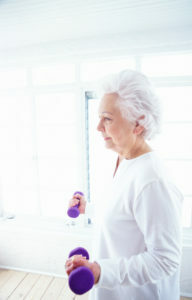 These exercises include walking, stair climbing, dancing, and lifting weights. 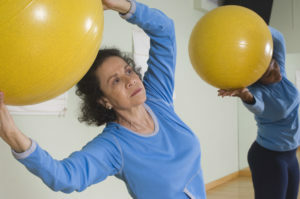 For those with osteopenia and osteoporosis, however, working against gravity is of the utmost importance to keep bone density high. Research shows promising benefits to wearing a weighted vest, such as the OTvest™, for those with osteopenia and osteoporosis. Wearing the comfortable, stylish OTvest™ weighted vest can provide increased work against gravity while conveniently doing daily activities--doing the dishes, going for a walk, and light tasks wherever the wearer might be. If you have bone loss, spinal issues, or other health problems, get your doctor’s permission before wearing the OTvest™. If you have osteoporosis, work with a qualified physical or occupational therapist to evaluate your movement and posture with the OTvest™ on, and check for any restrictions. Start by wearing the OTvest™ for about 15 minutes a day, adding 15 minutes each day. Build up time slowly to an hour twice a day. If there is any pain, remove and shorten the amount of time that the OTvest™ is worn. Listen to your body—as everyone is different, removing it when you need to. 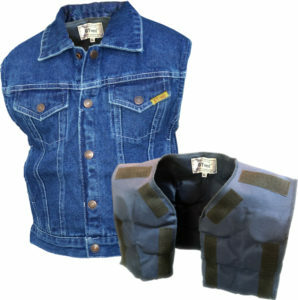 Wear the OTvest™ while standing, walking, dancing or sitting. Most wearers feel that they automatically stand straighter, and open their chest more because of where the weights are positioned in the OTvest™. The weights in the OTvest™ are evenly distributed front and back to help prevent kyphosis and lordosis, but make sure you have good posture while wearing the OTvest™ by checking in a mirror. The OTvest™ provides deep pressure therapy for the wearer, making the body work against gravity even more. Working against gravity is what stimulates bone growth. Unlike other weighted vests, weighted blankets, or compression vests on the market, the OTvest™ can provide deep, sustained pressure using less weight than other weighted vests. This is because the OTvest™ contains dense, steel plates, compared to the bulky sand or pellets found in other weighted vests. Not only this, but the placement of the weight is sitting directly upon the body -- not hanging loosely in pockets as is the case in other weighted vests. This sustained deep pressure can create a sense of well-being, increasing focus and function, promoting better sleep, and decrease anxiety, stress, and agitation. And since the wearer is required work more against gravity when wearing the OTvest™, bone density in those with osteoporosis is improved! The OTvest™ weighted vest is designed to be worn during all daily activities--unlike other weighted vests, weighted blankets, or compression vests, which have a definitive therapeutic look to them.